Click here to take the Oral Health Quiz! Kittens are born without teeth. Their first set of teeth, deciduous or baby teeth, start to appear within one to two weeks. At 6 weeks old, all 26 baby teeth are present. Within four to five months, they begin to get their adult teeth and at 6 months, all adult teeth are present. The teeth includes 12 little incisors, 4 canine teeth, 10 pre-molar, and 4 molar. They are attached by the periodontal ligament to the gingiva, or the gum. There are several common dental diseases in cats such as Periodontal Disease, FORLs or tooth resorption (Feline Odontoclastic Resorptive Lesions), tooth root abscess, and LPGS (Lymphocytic/Plasmacytic Gingivitis and Stomatitis). The main cause of most dental problems in cats is a build-up of plaque. 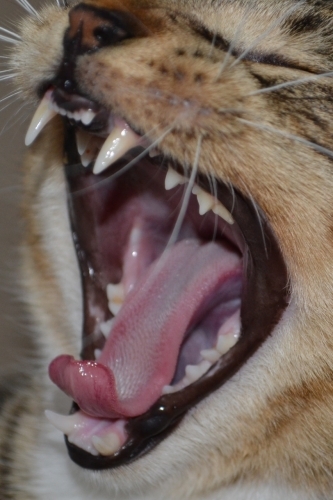 When bacteria on the cat's teeth mixes with the carbohydrates or protein from its food, plaque builds up. It eventually hardens into tartar and can harm the tooth and gums and even get bacteria and disease into the bloodstream. Older cats and oriental-type breeds are all more prone to dental problems. Periodontal disease is when tartar causes the gums to become inflamed and bleed as the tissue surrounding the teeth recedes. Cats infected with feline leukemia, HIV, or calicivirus are more likely to have periodontal disease. The way veterinarians treat this disease depends on the severity of it. In the early or advanced stages of Periodontal disease, it is just a mild or sever form of gingivitis. In this case, a professional dental cleaning will need to be done to scrape away the build-up of plaque and tartar on the teeth. If it progresses into the official stage of early or severe Periodontal disease, a professional dental cleaning will ensue as well as performing dental radiology to determine the options for treatments. The first option is root planing and subgingival curettage. This is when the vet performs a difficult procedure and removes residual calculus and diseased cementum or dentin, and smooths the root surface. There is also the option of subgingival curettage which is another difficult procedure when the vet removes diseased epithelium and connective tissue. A third option is periodontal debridement in which irritants to the tooth and root surface such as bacteria and endotoxins produced by the bacteria are removed through special ultrasonic scalers. A fourth option is performing a gingivectomy where excess gingiva is removed so bacteria can no longer live there. Periodontal surgery is another treatment. These surgeries are when a flap of the gum over the root of the tooth is opened to be able to reach the deeper parts of the tooth. There is also something called special therapeutics, newer materials that can do things that help the gum and bones heal. The final, and most obvious solution is, if the tooth can't be saved, to take the tooth out. FORLs or tooth resorption is when the gum resorbs the tooth throught resorptive lesions for some reason that is yet to be determined. Studies show that 28-67 percent of cats have tooth resorption. It is the most common cause for teeth that are lost in cats. The only treatment for this is to extract all or part of the tooth. LPGS is a painful condition with severe inflammation of the gums and other structures in the mouth as a result of an allergy to plaque. The actual cause is unknown.The only known successful treatment is to extract the tooth, although there are other methods that may sometimes work. Dental disease is common in cats. This is because in the wild a cat would clean its teeth by eating its dead prey. In our homes, cats eat moist and soft food that lets plaque build on the teeth. One way to help reduce plaque build up is by feeding your cat hard, crunchy food or treats daily. Some treats are specially designed to remove plaque and tarter build- up. Also, if possible, brushing your cats teeth a few times a week would help, although most cats despise this and do not allow this as an option. There are dental wipes that are easier to handle than a toothbrush that may be purchased from a pet store or your vet. Signs that a cat's mouth is hurting is pawing at the mouth, drooling, bad breath, inflamed, red, or bleeding gums,or turning the head to one side while eating so as not to chew on a particular tooth. If your cat is displaying any of these symptoms, contact your veterinarian.